If 2016 was the year that the Internet of Things transitioned from an ill-defined buzzword to a mainstream industry, 2017 saw the growth and maturing of IoT across all verticals globally. As we move forward in 2018, a more sober, pragmatic tone has emerged that reflects the complexity of scaling operationally focused IoT applications and the necessity for analytic workloads running at several points on the continuum from the far edges of the IoT networks, to aggregation points, to the centralized cloud. 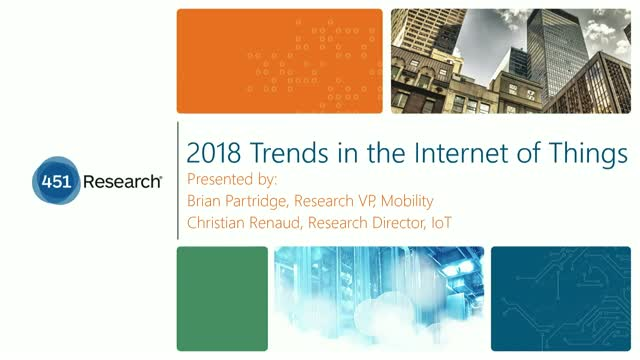 Join 451 Research’s leading IoT analysts, Brian Partridge and Christian Renaud, for a live webinar on February 9 as they review the trends expected to shape the IoT landscape in 2018, and the level of impact those trends will have. Come armed with questions, as there will be a live Q&A session at the end of the webinar.